We are having dinner inside at a vineyard and are considering putting up a small awning for the band and then not tenting the dance floor for the wedding reception. So, our guests would be dancing under the stars! Any thoughts? Real wedding experience with this kind of a set up? The wedding sounds lovely, and it is right up my alley. My specialty is tented wedding events - big or small. I truly love what a tent does for an event, especially a vineyard wedding. I love your idea of dancing under the stars, but I would caution you on this. Make sure that the small tent set up for the band will truly cover them in case of rain. Your band will have a lot of equipment that is easily ruined if the skies open up and decide to rain on your parade so to say. You and your fiancé could be held liable to replace it all if this did happen. I have never run a wedding event in MI, but here in NJ/NY what I always say to a client such as yourself is to rent a tent to cover the dance floor, just in case. If the weather report says without a doubt there will be no rain in the forecast then cancel the tent for the dance floor. Make sure you have a cancellation policy with the wedding tent vendor and know how many days notice you have to give them. You may lose 50% of your deposit, but it will be well worth it to ensure your piece of mind leading up to your big day. And if it does rain, you still have a tent secured at the rental house. So again, no worries. The rental company may even have a clear span tent to put over the dance floor, so even if it does rain that evening the stars will not be unseen since the tent material is clear. Go and investigate your options and I hope you have a starry night to remember! Our wedding reception location is at a vineyard in October inside of the wine cellar of the house on the grounds. While I love the idea of having a fall vineyard wedding, I don't want the theme to be all about wine. 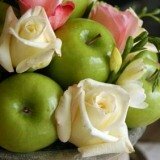 I would like to include other fall items like apples and leaves in my decorations and centerpieces. Is this OK, or should we just stick to using the wine/vineyard theme? Yes, this is perfectly OK and will probably work out really well. Just make sure that the centerpieces and decorations match the decor in the wine cellar. 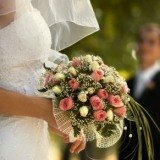 Your florist and coordinator should be able to help you come up some ideas.